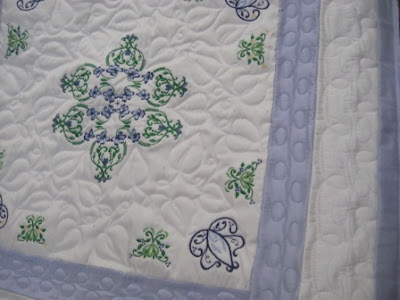 I have done another on of Laddie's quilts. She does this great machine embroidery on her home machine with a card. This quilt is all silk and blue and white. Her thread she uses for the embroidery is Rayon. I got my internet back. 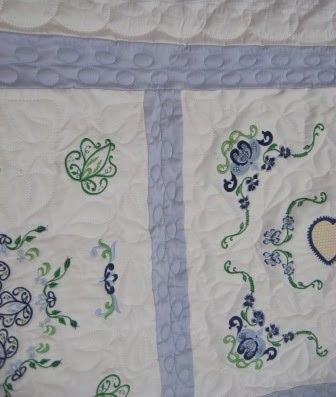 I will plan to make a quilt post on Tue like this one or my own quilts. I pick Tue for quilting because my quilt bee group use to meet on Tue. Then I am hoping to have enough done on my art journal to make a post on Thursdays. My other crafts and hobbies will be when they happen.